After advancing to the semifinals defeating Pierce City convincingly 47-31, the Lady Indians (8-1) squared off against the Parsons Vikings (6-3) for a spot in the championship. The Lady Indians had their hands full in Wednesday’s game as they faced recent career 1000-point scorer Nena Taylor. Rebounding and blocking out became the ultimate key for St. Paul, to stop the Vikings with their height advantage. Great passing in the first, as well as continued ball hawking defense from senior Taylor Wiatrak, pulled the Indians ahead at the end of the first, 10-5. 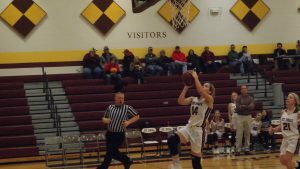 Parsons was able to get back into the game in the second quarter off stale shooting from the Indians as St. Paul was not able to score until halfway through the quarter. It became a battle of Katie Coomes vs. Nena Taylor as they battled it out for supremacy in the post. Parsons would regain the lead at the half, 16-15. Zone defense from the Vikings halted the Lady Indians from shooting outside where they thrive. But with key screens and great ball movement, the Indians were able to break the zone cashing in shots at the right time as St. Paul took back the lead 25-24 at the end of the third. Both teams were held to minimal baskets within the fourth quarter as neither team was willing to pull away. In a closely contested matchup, the game would result in overtime as the score at the end of regulation was a tie at 28. Key baskets by juniors Emily Hutcherson and Taylor Wiatrak tied the game up as St. Paul had an opportunity to seal the game with 13 seconds left. Coomes fouled out in the following play which gave Parsons the ball with 6 seconds left. Parsons then drove the ball down the court as senior Bre Bedore hit a three as time expired in overtime to give the Vikings a 36-33 win over St. Paul and put them in the Southeast Lancer Classic championship. Junior Katie Coomes continues her hot shooting as of lately finishing the game with 17 points. Hutcherson finished with 6 points including some key baskets and Wiatrak ended her night with 5 points, respectively. St. Paul (8-2) will play in a rematch from earlier this season against the Southeast Lancers (8-3) for 3rd place Friday, Jan. 18, at 4.